After appearing at the Cartwright Hall Art Gallery in Bradford and the Lady Lever Gallery in Liverpool, ‘Rossetti’s Obsession’ is now on display at the William Morris Gallery in London. This small but fascinating exhibition explores Dante Gabriel Rossetti’s preoccupation with Jane Morris, the wife of his friend William Morris. 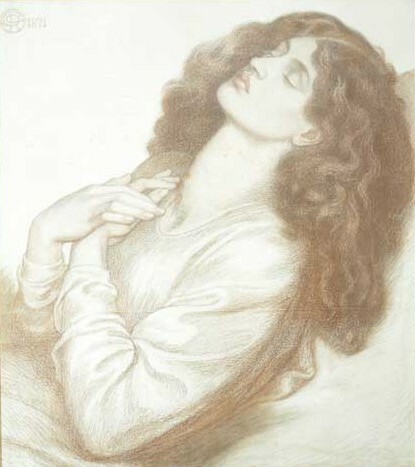 The exhibition not only examines an artist’s obsession with his muse, however; it reveals how Rossetti challenged Victorian conceptions of ideal femininity by formulating an unconventional, ‘aesthetic’ type of beauty characterised by a columnar neck, thick waves of hair, well-defined brows, large, expressive eyes, sensuous lips, and long fingers. The grouping of Rossetti’s pictures of Morris together encourages the viewer to examine the artist’s portrayals and search for connections. Repeatedly her facial expression seems ambiguous – her exaggerated lips and eyes are counterbalanced by a sense of remoteness, suggesting that she is deep in thought. 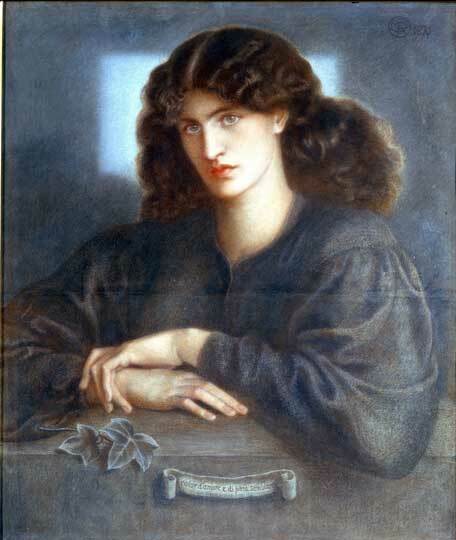 Interestingly, Morris acquires a kind of masculine heroism in Rossetti’s larger compositions, where he depicts her with massive limbs and large throat. The interplay between her intense, imposing presence and unattainable, enigmatic features is captivating, producing a dynamic, multi-dimensional impression of femininity. Photographs of Morris posed by Rossetti at Tudor House in Chelsea are shown alongside drawings of the model reclining or sleeping. Dressed in loosely flowing clothes rather than the constricting garments of traditional Victorian dress and positioned in serpentine poses, the weariness and languor of Morris’s body acquires a sense of fluidity. There’s a suggestion of latent power in her loose limbed, apparently boneless form, and in her ability to move between a variety of poses and personas. Morris is depicted as a variety of fictional characters throughout the show, including Mariana, Mnemosyne, Pandora, Beatrice, and Astarte. 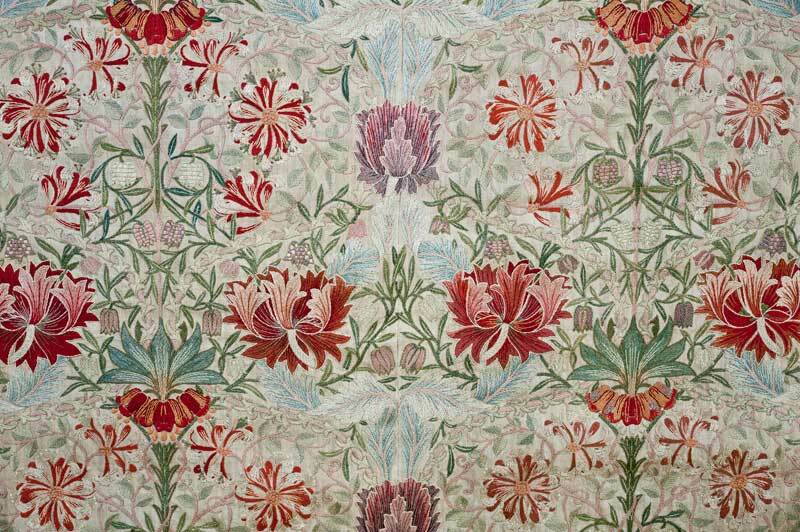 But the exhibition also features a portrait of Morris in old age by her artist friend Evelyn De Morgan and a beautiful embroidery designed by William Morris and embroidered by Jane and her daughter Jenny in the 1880s. They leave you longing for more glimpses into Morris’s own talents and interests, her real-life character. The recent publication of The Collected Letters of Jane Morris, edited by Jan Marsh and Frank C. Sharp, will hopefully draw more attention to Morris and offer new perspectives on her life, the artist-model relationship, and the wider work of the Pre-Raphaelites. 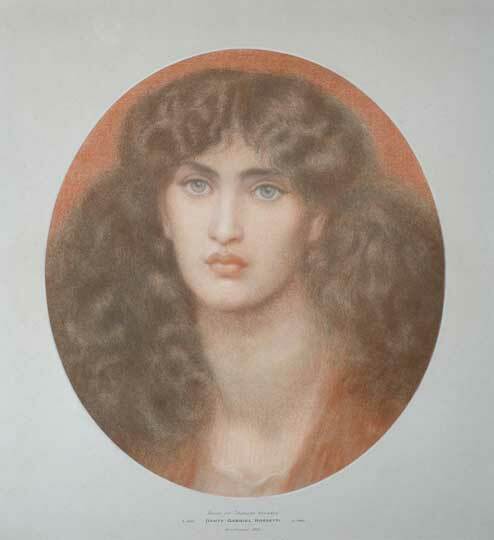 ‘Rossetti’s Obsession: Images of Jane Morris’ is at the William Morris Gallery, London, until 4 January 2015.